J.D. Wright pauses to check in with his wife of 51 years. “Do you remember, Mama, when that wind was?” After a few minutes perusing her cellphone photos, she reports back: Tumbleweeds first buried the house on November 17. The gusts screamed up and there they were, piled so deep over the doors and windows that Wright, who has a ranch on the Crowley-Pueblo County line in southeastern Colorado, had to call his grandson to come dig the couple out with a front end loader and pitchfork. Since then, the house has been completely buried twice more, and partially buried five or six times. On one trip to town for groceries and a doctor’s visit, so many tumbleweeds clogged the road home that the couple didn’t make it back until the following day. “We had some bad weeds in the ‘50s and the ‘70s” – both decades saw serious dry spells – “but nothing like this,” says Wright, whose family has been on the place since 1950. They had always managed to keep running cows then, for example. The latest drought, though, has forced them to sell their 125-head herd and get by on income from odd jobs and Wright’s truck and equipment repair shop. The Wrights’ story is not unusual on Colorado's corner of the Southern High Plains these days. 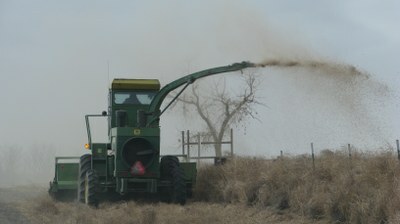 “That neck of the woods has had a significant tumbleweed issue for a couple of decades,” in part because farmers are fallowing fields as they sell their water rights to growing Front Range cities, leaving bare dirt and little financial incentive to control weeds, explains Eric Lane, director of the state Department of Agriculture’s Conservation Services Division. Meanwhile, an extreme drought has hammered both cultivated fields and grasses and forbs on unplowed ground over the past three years, rolling huge dust storms over the state line into Oklahoma and Kansas. And because tumbleweeds are annuals, their seeds can colonize all that denuded soil in response to changing conditions much more quickly than the native perennials. When a big deluge of rain finally hit the area last fall, the tumbleweed population exploded, sending vagabond skeletons scything over the prairie with each passing cold front, dispersing seed hither and yon. Tumbleweeds clog a road fenceline to fenceline all the way to the horizon. The exotic plant, also known as Russian thistle for its Eurasian roots, was accidentally imported into the United States in the 19th century. It has clogged 42 miles of roads in Crowley County alone since last fall. 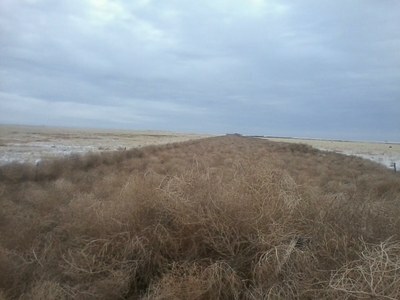 In the most extreme case, tumbleweeds piled fenceline to fenceline over a road to a depth of seven feet for six miles. 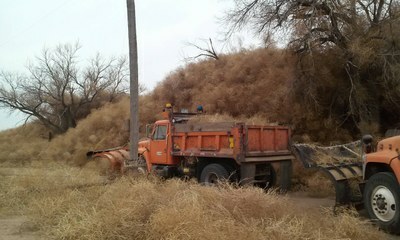 Snowplows tackle tumbleweeds in southeastern Colorado. With the tumbleweed problem still looming large, Action 22, a nonprofit that advocates on behalf of southern Colorado’s local governments and businesses, pulled together a meeting a couple of weeks ago to give communities an opportunity to share stories and weed-whacking tips. A Pueblo steel mill contractor relayed that the company had spent $300,000 removing the weed from its water ditches; someone else told how emergency personnel had to rescue people from yet another house that had been submerged by weeds in West Pueblo. Some spoke of baling tumbleweeds and mixing them with alfalfa for cattle feed; others were cautiously burning them or grinding them up and spreading them around. Nothing had yet proved a perfect solution. “Maybe we could just tell the Russians to come back and pick them up,” laughs Action 22 President Cathy Garcia, who is now looking for state and federal programs that communities may apply to for assistance in tackling the tumbleweed plague. One of Crowley County's dinosaur weed choppers at work. Sarah Gilman is associate editor at High Country News. She tweets @Sarah_Gilman. Images courtesy Crowley County.